After Toyota left Formula One at the end of 2009, the factory at Cologne restructured completely and focused towards performance services and consulting towards motorsport teams. As clients continue to flock in, the company is hiring new staff to meet demands. Following the sudden decision by Toyota to drop its Formula One commitment, a completely different business plan was laid out to find a meaningful purpose for the modern factory. Jens Marquardt explains: "What has impressed me most this year has been the professionalism of eve-ryone here. It was a shock to the system to change our business model so dramatically but the peo-ple here have put their heart and soul into making this company successful." Naturally for a company to whom confidentiality is an essential trait, TMG is cagy when it comes to the ex-act numbers behind its first year of service supply. Income runs into the multi-million euro bracket and the company is on course to meet its 2010 targets. "I'm content with what we have achieved since November 2009 but I don't want to settle for that. We have the ability to deliver a complete project, from a blank sheet of pa-per right through to a car rolling out of the workshop and I want to see more major projects like that." "TMG still has a way to go before we reach our ulti-mate goals so we are con-stantly striving for more and bigger projects; we love a challenge!" A growing client list has required TMG to once again recruit new staff, with original estimates for a workforce of 150 now raised to around 180. Many of the Formula One engineers were retained, including Pascal Vasselon, who is now General manager of chassis engineering. 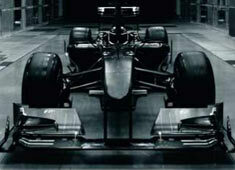 He highlights that the legacy of the team's F1 participation is a facility equipped with all modern race technology. "It's incredible to see the reaction of ex-perienced engineers when they first visit our facilities and understand the proc-esses we have in place." "I think there is a belief that F1 engineering is a very narrow specialisation. But our customers are hugely impressed to learn about the breadth of our engineering expertise and the variety of equipment available. TMG offers much more than motorsport engineering; that is obvious to any visitor." Many new projects have come from outside the motorsport world, and TMG is currently even supporting electric vehicle production and design. In its short lifetime, TMG was praised by many and has already been nominated as "Best motorsport facility", an award handed by the professional motorsport world expo.